Robert Ford, the first US ambassador to Syria in five years, marched with the regime change protesters. He traveled through Syria inciting rebellion against Assad, according to this interview with a former CIA agent. Ford had to flee the country out of fear. I get that you’re using the little-known “League for the Revolutionary Party” at a forum as a case example — a reason for us lefties to align on anti-imperialism. Fair enough. However, though you used “members of” wording, on a quick read it sounded like DSA itself took the LRP’s misguided stance or aligned with it. I find that very hard to believe. Could you clarify, please? Thanks! We intended to say the opposite. This little group did not do this as ISO or DSA, but they were recognized members of ISO and DSA by various observers. If they did this on behalf of DSA they would have said so as DSA is a real organization, this revolutionary league seems like a quickly made up group for some individuals to take this action with. It would be excellent if DSA and ISO said they did not support the protest against Baraka. I hope they distance themselves from it. Kevin, an excellent article on “Imperialism” — which, of course, reinforces, highlights, comports exactly with, and complements any such efforts to ‘expose’ this damn cancerous tumor of the Disguised Global Capitalist Empire, which is nominally HQed in, and merely ‘poses’ as, our former country. BTW, the latest dictatorial deceit and enforcement by the disgusting and dirty DNC that Bernie can’t run in ’20 except as a true independent is actually a big beautiful ‘gift’ in disguise. “This is actually fabulous news!!! Now that Bernie has been thrown out, by the effin DNC, of any useless possibility to run as a phony Democrat —- we have a true “Socialist Independent” (who, of course, would be crazy to run as anything but a GREEN — which BTW is theonly party to be explicitly, overtly, and boldly committed already as being Anti-EMPIRE) — and all of these amazingly fortuitous elements of luck are coming together just at the right time to kick the sheet out of EMPEROR TRUMP and his insane megalomaniac sociopathic stupidity of making our country “act like an EMPIRE” during his first and last effin term in the office of president!!! 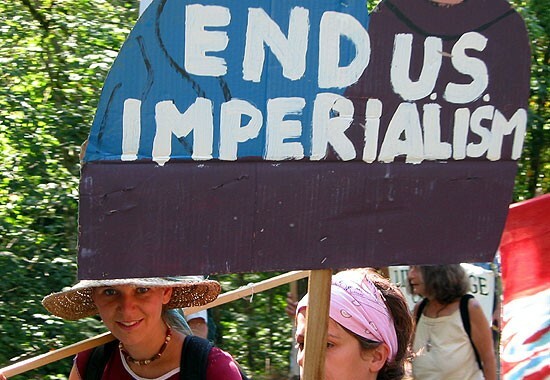 Ending EMPIRE is essential if we are to survive — so the end of this first and last in world history, ‘effectively-disguised’, ‘truly-global’, ‘dual-party Vichy’, and ‘capitalist-fueled’ EMPIRE is to be applauded, eh! As you well know, Chris, educating, enlightening, and encouraging people to non-violently take unified action in a “Revolution Against Empire” [Justin du Rivage] is the key to any winning “Competitive Strategy” (and matching ‘Strategic Narrative’). “Empire abroad entails tyranny at home”! Sanders is more likely to become a Democrat than to run as an independent or third party candidate. He will need to be pushed hard to run independent of the Dems. Hillary Clinton donated to him when he ran for the Senate the first time. He has put his name on Democratic Senate Campaign Company fundraisers. He has not been challenged in his runs for the Senate. He is the director of outreach for Senate Dems putting him in the leadership of the party in the Senate. He is basically a Democrat disguised as an independent. But, he should be pushed to run as an independent. The imperialist business is to organize a dispute and act as a judge. Excellent! I just forwarded to our state Greens list. Does anyone else smell COINTELPRO, 2.0? You don’t even expect your readers to check your sources. You write that on the 3rd day of protests in Dara’a, they became violent. But if you check the article you linked to, it clearly states that peaceful marchers had been previoiusly killed by Assad’s snipers. I understand that you people are totally Islamophobic but Syrian lives matter just as much as Palestinian’s. That is why Hamas supported the protests in Syria even though you would sweep that fact under the rug. As to your allegation of being “totally Islamophobic”, a claim that made no sense to me. A private email said “As with the Islamophobic smear made against PR – totally without justification – he is vicious and unprincipled in his attacks.” We are not Islamophobic as a review of this website will show we oppose discrimination against Palestinians and support liberation of Muslim-dominant nations. The phobia, if you want to call it a phobia, is of US imperialism. The US has been working to control Syria for decades. It is important to US empire for various imperialistic and hegemonic reasons, as we describe in the article. US funded and supported change in the Syrian government will not be for the benefit of the Syrian people, but for the benefit of the United States and its corporations. I appreciate people who have followed your career writing me because it explains your comment, which made little sense to me. I hope other readers now know about your bias which attacks those who oppose US imperialism. Where did my supporting comment to you go, Kevin? When there is a link to another article it is delayed. It was just approved a few minutes ago. Kevin, excellent an important article. I see it’s been quoted and circulated on other sites. One suggestion, there are many typos or editing errors. For example the sentence “Iran: US imperialism in Syria is tied to in Iran.” Which is not as clear as it should be. The reason I raised this is because bringing up and explaining to the general public, especially US citizens, the nature of and historical reasons for US imperialism is vital to the building of a progressive movement. We know how years of indoctrination have blocked average Americans from being able to even consider the painful realities of their own country. For example use the word Imperialism in a sentence and unless you’re talking about the British or maybe the French, their mind will suddenly go blank and they have difficulty hearing or remembering what was said. Your article needs to be just one of many that help overcome this indoctrinated automatic reactionary blindness.